Hromads’kyi holos (Community Voice). 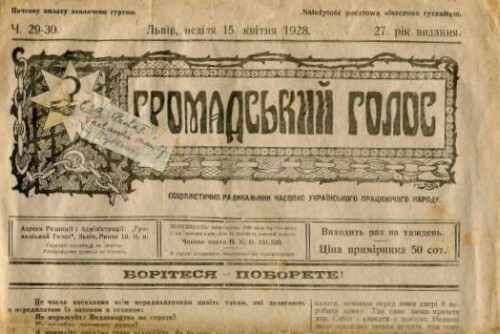 A popular monthly, then semimonthly (1906–9), and finally weekly (from 1910) magazine published in Lviv from 1892 to 1939, with breaks in 1914–16 and 1918–21. It was the organ of the Ukrainian Radical party in Galicia, and then (from 1926) of the Ukrainian Socialist Radical party. Its editors included Viacheslav Budzynovsky (1892–6), Ivan Franko (1896–7), Mykhailo Pavlyk (1898–1903), Les Martovych (1904), and Ivan Makukh (1905). Under the title Novyi hromads’kyi holos, its editors were I. Yaremko, Pavlo Dumka, M. Viniarsky, Pavlo Volosenko (1906–8), Dmytro Katamai (1911–14), Osyp Nazaruk (1916–18), Ostap Pavliv-Bilozersky (1922–8), and M. Stakhiv (1929–39). The more eminent contributors were I. Franko, Vasyl Stefanyk, Marko Cheremshyna, Mykyta Shapoval, and Panas Fedenko. Monthly supplements included Sichovi visty (Lviv) (1912–14, 1922–4, ed D. Katamai), Molodi kameniari (1928–32), and Snip (1936–7, ed O. Pavliv).